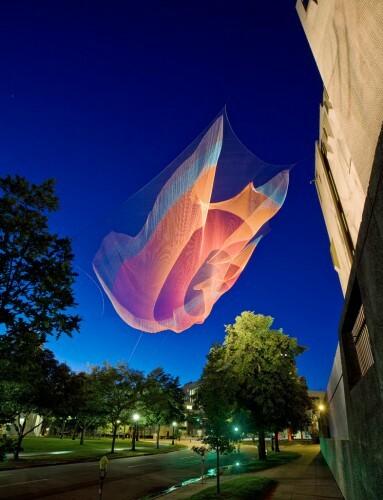 Inspired by the local materials and culture of Mahabalipuram, an Indian fishing village famous for sculpture, American Artist Janet Echelman stumbled upon a material that would change her art, and life, forever. One evening, while observing the fishermen’s nightly routine of bundling their nets, Echelman imagined a new type of sculpture – a volumetric form that could be the scale of a large building but remain light enough to ripple in the wind, constantly reshaping the net and creating ever-changing patterns. With a sophisticated mixture of ancient craft and modern technology, Echelman collaborates with a range of professionals including aeronautical and mechanical engineers, architects, lighting designers, landscape architects, and fabricators to transform urban environments world-wide with her net sculptures. 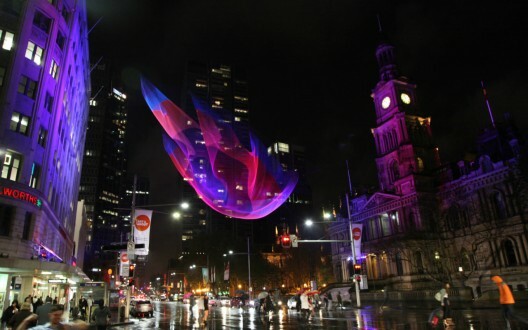 Continue after the break to view some of Echelman’s most famous projects. Using color and material to invoke the memory of the site’s history as a fishing and industrial center, this three-dimensional multi-layer net floats over the Cidade Salvador Plaza. This work is credited as the first permanent, monumental public sculpture to use an entirely soft and flexible set of membranes moving fluidly in wind. The work casts cinematic shadow drawings onto the ground further highlighting the “wind choreography.” The the city has made the sculpture its graphic symbol. When interviewed, local people give different interpretations of the work, from fishing nets, ships and masts of the Portuguese maritime history, the red-and-white striped smokestacks of the area’s industrial past, to Portuguese lace, sea creatures and ripples in water. Three steel poles, ranging in height from 25 to 50 meters, are painted white with red stripes to reference nearby smokestacks and lighthouses. These poles support a 20 ton steel ring, 45 meters in diameter, from which the net weighing about one ton is suspended. The ring greets the ocean at a slant, ranging from 13.5 meters off of the ground at the lowest point and 27 meters at the highest. The smokestack reference is continued through the red and white stripes of the net. The net is comprised of 36 individual mesh sections in different densities, hand-joined along all sides into a multi-layered form. The net material is TENARA architectural fiber, a 100% UV-resistant, colorfast fiber made of PTFE (poly-tetra-fluoro-ethylene), the substance most widely known as the non-stick cooking surface Teflon. This project makes visible to the human eye the patterns of desert winds. During the day, sunlight projects patterned shadow drawings onto the ground and pedestrians on their daily paths. At night, the colored illumination gradually changes color through the seasons. The large three-dimensional multi-layered form is created by a combination of hand and machine knotting of recyclable high-tenacity colored polyester that is replaced in new color variations at intervals. 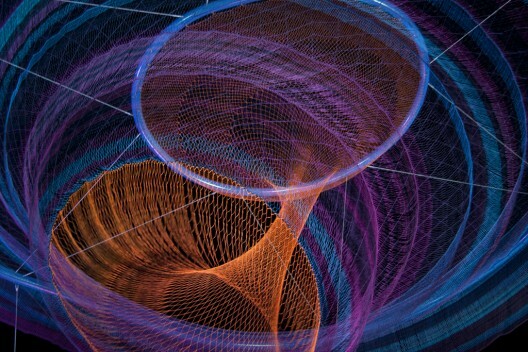 The sculpture is comprised of painted galvanized steel and cables, changing sets of recyclable high-tenacity polyester braided twine netting and colored lighting with computerized programming. Tsunami 1.26, an aerial lace installation, was inspired by the 2010 Chile earthquake’s ensuing tsunami and the 1.26-microsecond shortening of the day that resulted from the earthquake’s redistribution of the Earth’s mass. By meditating on these epiphenomena, the work underscores the interdependence of Earth systems and the global community. It asks the viewer to pause and consider the larger fabric of which they are a part. Studio Echelman generated a 3D model of the tsunami using data from NASA’s Jet Propulsion Laboratory and the NOAA Center for Tsunami Research and then used software to transform an outline of the model’s higher amplitude area into a sculptural form. Additionally, the studio created hand-knotted models to achieve the complex shaping of the piece. 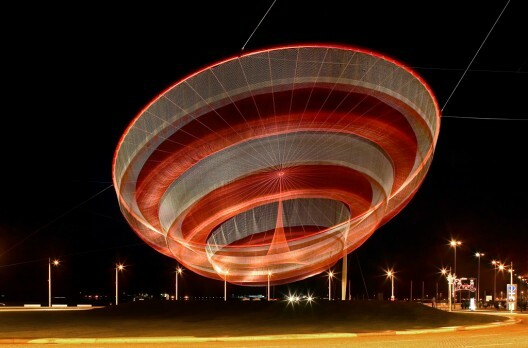 This artwork utilizes Spectra, a material 15 times stronger than steel by weight. The mesh is knotted by machine in order to withstand winds, but is engineered to reflect the intricacy of handmade lace. The City of Denver asked the artist to create a monumental yet temporary work exploring the theme of the interconnectedness of the 35 nations that make up the Western Hemisphere. She drew inspiration from the NASA Jet Propulsion Laboratory’s announcement that the February 2010 Chile earthquake shortened the length of the earth’s day by 1.26 microseconds by slightly redistributing the earth’s mass. Exploring further, Echelman drew on a National Oceanic and Atmospheric Administration (NOAA) simulation of the earthquake’s ensuing tsunami, using the 3-dimensional form of the tsunami’s amplitude rippling across the Pacific as the basis for her sculptural form. The temporary nature of the Biennial and its accelerated timeline precluded the artist’s use of a permanent steel armature, as employed in the artist’s previous monumental permanent commissions. Instead, “1.26” pioneers a tensile support matrix of Spectra fiber, a material 15 times stronger than steel by weight. This low-impact, super-lightweight design made it possible to temporarily attach the sculpture directly to the façade of the Denver Art Museum, and this structural system opens up a new trajectory for the artist’s work in urban airspace. Because this monumental sculpture is made entirely of soft materials, it is animated by the wind. Its fluidly moving form contrasts with the rigid surfaces of the surrounding urban architecture. At night, colored lighting transforms the work into a floating, luminous form while darkness conceals the support cables. A book about “1.26” includes an essay by Sanford Kwinter, Professor of Architectural Theory and Criticism at the Harvard Graduate School of Design, cofounder of the journal Zone and Zone Books, and author of Architectures of Time: Towards a Theory of the Event in Modernist Culture. The red boardwalk and “sky lanterns” are inspired by the city’s cultural communities. Richmond has the largest immigrant population by proportion of any city in Canada with the majority of those immigrants being of Asian descent. The wooden boardwalk follows a curving path similar to the choreography of the Dragon Dance, a performance frequently seen in local Chinese festivals. The Nitobe Japanese garden and the Sun Yat Sen Chinese garden of the Vancouver region are important references, especially their material presence, intersecting paths and reflective ponds, and their framing of views. Water Sky Garden is a contemplative art environment that encourages participants to linger. 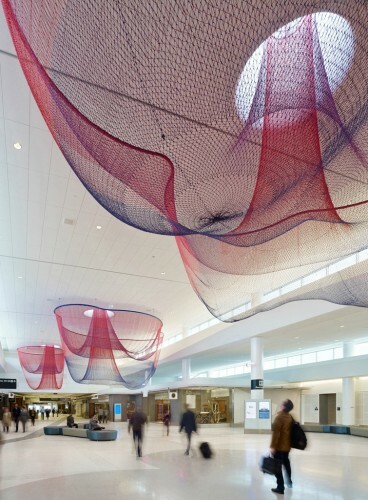 The overhead netted forms provide a new visual experience, putting art in the sky; at night they glow like lanterns. Nets have a special relationship with the site, as the native Musqueam Band continue to teach their children to fish using nets at this particular bend in the Fraser River to this day, and this area has a history of the fishing/canning industry which employed many ethnic groups. 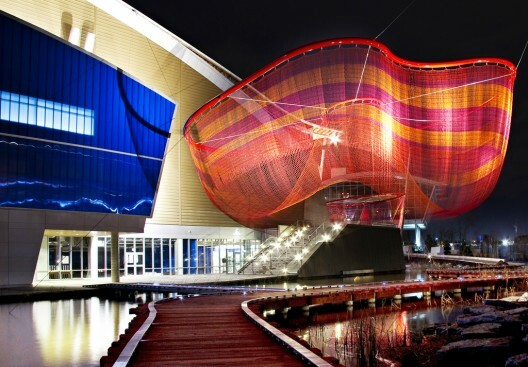 This project was achieved through Echelman’s collaboration with a team of international award-winning architects, engineers, lighting and water consultants, landscape architects and fabricators. Artist Janet Echelman transforms the terminal with fictional nature that subtly engages viewers with real and imagined natural forces. Her sculpture installation cuts three round skylights into the ceiling, from which descend delicate layers of translucent colored netting to create three voluptuous volumetric forms. A series of shaded outlines below are embedded into the terrazzo floor, reflecting the precise shadows that would occur on the summer solstice if the sun could penetrate through the roof. During the day, sun streams through the skylights to cast real shadows that interplay with the fictional shadows in the floor. 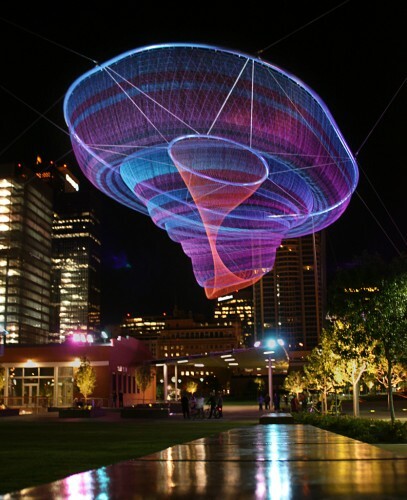 At night, the artist’s program of colored lighting makes the sculpture glow from indigo to purple, magenta to red-orange. Computer-programmed mechanized air-flow animates the fluidly-moving sculpture at different intervals throughout the day, as if the wind could magically flow through solid walls. All project descriptions provided by Studio Echelman.